How to Cite This Chapter: Legault KJ, Adachi JD, Denburg JA, Musiał J, Sznajd J. Systemic Lupus Erythematosus. McMaster Textbook of Internal Medicine. Kraków: Medycyna Praktyczna. https://empendium.com/mcmtextbook/chapter/B31.II.16.3 Accessed April 19, 2019.
van Vollenhoven RF, Mosca M, Bertsias G, et al. Treat-to-target in systemic lupus erythematosus: recommendations from an international task force. Ann Rheum Dis. 2014 Jun;73(6):958-67. doi: 10.1136/annrheumdis-2013-205139. Epub 2014 Apr 16. PubMed PMID: 24739325. Ruiz-Irastorza G, Cuadrado MJ, Ruiz-Arruza I, et al. Evidence-based recommendations for the prevention and long-term management of thrombosis in antiphospholipid antibody-positive patients: report of a task force at the 13th International Congress on antiphospholipid antibodies. Lupus. 2011 Feb;20(2):206-18. doi: 10.1177/0961203310395803. PubMed PMID: 21303837. Bertsias GK, Ioannidis JP, Aringer M, et al. EULAR recommendations for the management of systemic lupus erythematosus with neuropsychiatric manifestations: report of a task force of the EULAR standing committee for clinical affairs. Ann Rheum Dis. 2010 Dec;69(12):2074-82. doi: 10.1136/ard.2010.130476. Epub 2010 Aug 19. PubMed PMID: 20724309. Mosca M, Tani C, Aringer M, et al. European League Against Rheumatism recommendations for monitoring patients with systemic lupus erythematosus in clinical practice and in observational studies. Ann Rheum Dis. 2010 Jul;69(7):1269-74. doi: 10.1136/ard.2009.117200. Epub 2009 Nov 5. PubMed PMID: 19892750; PubMed Central PMCID: PMC2952401. Bertsias G, Ioannidis JP, Boletis J, et al; Task Force of the EULAR Standing Committee for International Clinical Studies Including Therapeutics. EULAR recommendations for the management of systemic lupus erythematosus. Report of a Task Force of the EULAR Standing Committee for International Clinical Studies Including Therapeutics. Ann Rheum Dis. 2008 Feb;67(2):195-205. Epub 2007 May 15. PubMed PMID: 17504841. Systemic lupus erythematosus (SLE) is a complex autoimmune disease leading to chronic inflammation of various organs and tissues. The etiology is unknown. Women are affected 6 to 10 times more frequently than men. In almost two-thirds of patients, the disease onset is between the ages of 16 and 55 years, although it can also present initially in children or the elderly. The presenting symptoms may be nonspecific, such as fever, malaise, or weight loss. SLE usually presents as a multisystem disease, though disease manifestations can sometimes be limited to a single organ, such as the skin or kidneys. The course is typically relapsing-remitting in nature; however, a complete resolution of clinical and laboratory manifestations can occur. 1) Systemic manifestations: Fatigue, low- or high-grade fever, weight loss. a) Acute cutaneous lupus erythematosus (ACLE) develops in 60% to 80% of patients with SLE; it may be limited to the face, involving the cheeks and nose (“butterfly rash”: Figure 1), or the lesions may be located on the forehead, around the eyes, or on the neck or chest. The lesions are frequently triggered by ultraviolet light, and the photosensitivity usually manifests within 24 hours of sun exposure. Rashes can persist from days to weeks. 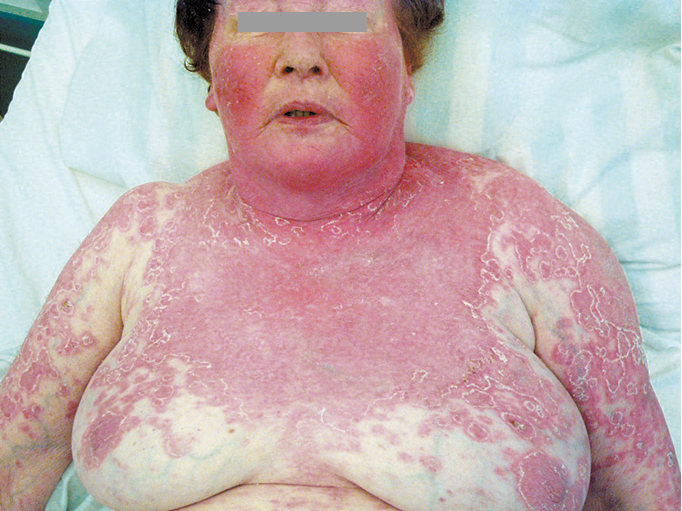 Acute cutaneous lupus can take several forms, including generalized erythroderma (Figure 2), papular or vesicular lesions, or it may be severe and bullous in nature, resembling toxic epidermal necrolysis. In patients with active disease, ulcerations of the nasal and oral mucosa are frequently found. These ulcerations can be painful or painless. b) Subacute cutaneous lupus erythematosus (SCLE) affects ~20% of patients with SLE and is a particular form of nonscarring photosensitive rash typically associated with anti-Sjögren syndrome A (anti-SSA) antibodies (also called anti-Ro antibodies). 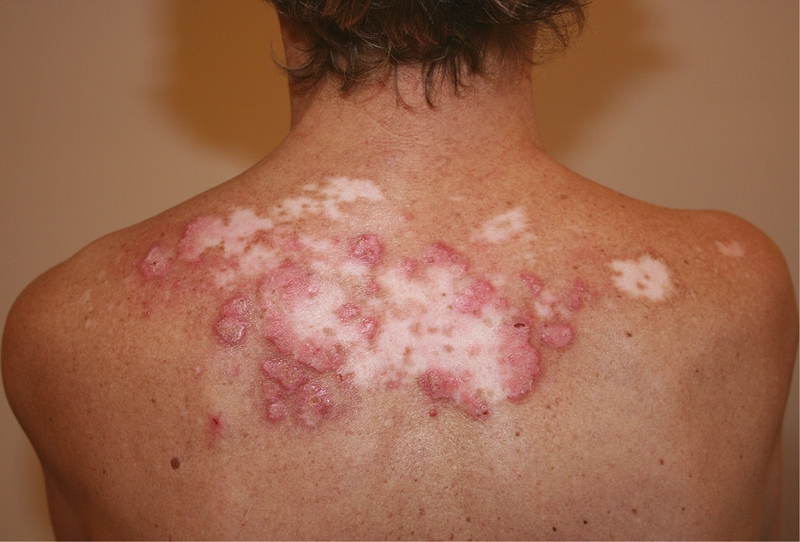 The lesions usually appear in one of 2 forms: circular, often raised, with a clear central area (Figure 3); or scaly, psoriatic-like patches. As the lesions are typically associated with sun exposure, they are usually located on the neck, arms, and chest. While they do not cause scarring, they may be responsible for abnormal pigmentation or telangiectasia. c) Chronic cutaneous lupus erythematosus (CCLE) is a noteworthy subgroup of cutaneous lupus, as it is often present in isolation, without any other systemic symptoms of lupus. Such patients are described as having isolated CCLE without having SLE. The most common variant of CCLE is discoid lupus erythematosus (DLE), which is characterized by erythematous or violaceous scaly plaques typically occurring on the head and neck, leading to follicular plugging, scarring, and localized alopecia (Figure 4). Early epidemiologic studies indicated that only 5% to 10% of patients with DLE would progress to fulfill the criteria for SLE, however, a more recent study has quoted a figure of >15%; incidence rates of SLE vary, depending on definition. Other CCLE rashes are hypertrophic (verrucous) lupus, lupus panniculitis (also called lupus profundus), chilblains lupus, and lupus erythematosus tumidus. d) Other, nonspecific cutaneous manifestations include alopecia, lichen myxedematosus, atrophia maculosa cutis, and neutrophilic dermatoses. e) Vascular cutaneous manifestations can be subdivided into those caused by true vasculitis (pathologic findings consistent with leukocytoclastic vasculitis or panarteritis) and those classified as a nonspecific vasculopathy. Cutaneous leukocytoclastic vasculitis can present clinically as palpable purpura with or without ulcerative lesions or as urticarial vasculitis. Panarteritis can present similarly or with subcutaneous nodules resembling polyarteritis nodosa. Vasculopathy-type manifestations include Raynaud phenomenon (in 15%-40% of patients), livedo reticularis, cutaneous ulceration/necrosis, palmar erythema (particularly of the thenar and hypothenar eminences), fingertip erythema, nail-fold telangiectasias, erythromelalgia, splinter hemorrhages, Osler nodes, and Janeway lesions. The presence of cutaneous vascular lesions has been associated with a higher overall SLE disease activity. Skin ulcers, livedo reticularis, splinter hemorrhages, and fingertip erythema have been found to be associated with antiphospholipid antibodies. 3) Musculoskeletal manifestations: More than 80% of patients complain of arthralgia and/or myalgia, which are often migratory and of variable severity. A smaller number of patients develops a true inflammatory arthritis, typically affecting the small joints of the hands and/or feet; when the hands are affected, it usually involves the metacarpophalangeal (MCP), proximal interphalangeal (PIP), and wrist joints, and can be deforming. Although in these characteristics it can be indistinguishable from rheumatoid arthritis (RA), unlike RA it is nonerosive; this deforming, nonerosive arthritis is termed Jaccoud arthropathy. Tendonitis and tendon rupture as well as joint laxity are reported more frequently in patients with SLE than in the general population. Patients with SLE can also develop generalized myositis, with elevated creatine kinase (CK) levels and inflammatory or necrotic changes on muscle biopsy, often similar to the changes found in dermatomyositis or polymyositis. Myositis is important to differentiate from myalgia, as only proven myositis warrants the introduction or augmentation of high-dose glucocorticoid and/or immunomodulatory therapy. a) Class I – Minimal mesangial lupus nephritis: Normal urinalysis, minimal to no urine protein, and normal creatinine levels. Light microscopic findings are normal; however, immunofluorescence and/or electron microscopy reveal mesangial immune deposition. Given the lack of clinical or biochemical findings, this type of nephritis is rarely diagnosed, and no treatment is indicated. b) Class II – Mesangial proliferative lupus nephritis: Microscopic hematuria and/or proteinuria on urinalysis, usually small amounts of proteinuria without evidence of nephritic or nephrotic syndrome, creatinine levels generally normal. Light microscopy reveals mesangial hypercellularity, matrix expansion, or both. Occasional subepithelial or subendothelial deposits can be seen on immunofluorescence or electron microscopy. Renal prognosis is generally excellent, and no treatment is indicated. c) Class III – Focal lupus nephritis: Hematuria and/or proteinuria is generally present on urinalysis, features of nephritic or nephrotic syndrome can be seen, red blood cell casts are characteristic, and creatinine levels are often elevated. By definition, <50% of glomeruli are involved, with endocapillary and/or extracapillary glomerulonephritis typically affecting <50% of the glomerular tuft (ie, segmental involvement). Immunofluorescence and electron microscopy usually reveal subendothelial immune deposition in the glomerular capillary wall. Fibrinoid necrosis and crescent formation can also be seen. Immunomodulatory therapy is indicated for this class of the disease, as there is a risk of renal impairment. Class III lupus nephritis is further classified based on whether the lesions are acute (A), referred to as “focal proliferative nephritis,” acute and chronic (A/C), referred to as “focal proliferative and sclerosing nephritis,” or chronic (C), referred to as “focal sclerosing nephritis.” Treatment is indicated (see below). d) Class IV – Diffuse lupus nephritis: Presentation and pathologic findings are similar to class III lupus nephritis; however, by definition, >50% of the glomeruli are involved. It is more severe than class III lupus nephritis, and patients generally present with more pronounced clinical and biochemical abnormalities. Class IV lupus nephritis is further classified based on whether the lesions are segmental (S) or global (G), and whether the lesions are acute (A) or chronic (C). Class IV disease with acute lesions is referred to as “diffuse proliferative nephritis,” while class IV disease with chronic lesions is referred to as “diffuse sclerosing nephritis.” Treatment is also indicated for class IV disease (see Treatment of Specific Organ Manifestations, below). e) Class V – Membranous lupus nephritis: Typically associated with nephrotic-range proteinuria; microscopic hematuria may be seen. The disease usually presents with nephrotic syndrome, though typically with normal creatinine levels. On light microscopy, there is typically thickening of the glomerular capillary wall. Immunofluorescence and electron microscopy reveal subepithelial immune deposits. Class V lupus nephritis can coexist with class III or IV and treatment would be indicated in these cases, as comorbid class III or IV disease portends a worse renal prognosis. Isolated membranous nephropathy has a far better prognosis, with 10-year renal survival rates between 70% and 100% in studies. Immunomodulatory therapy for class V lupus nephritis is indicated only in the presence of nephrotic-range proteinuria (>3 g/24 hours). f) Class VI – Advanced sclerosing lupus nephritis: Generally bland urine sediment and slowly rising creatinine levels. Light microscopy reveals sclerosis of >90% of glomeruli. Active inflammatory changes are not seen. Class VI represents an end-stage progression of previous class III, IV, or V disease, and immunomodulatory therapy is unlikely to be of benefit at this stage. Other renal manifestations include tubulointerstitial disease and renovascular disease. Tubulointerstitial disease is often seen in conjunction with glomerular disease and carries a worse renal prognosis and higher risk of concomitant hypertension. In isolation, it can cause distal renal tubular acidosis or disturbance in the electrolyte balance, such as hyperkalemia or hypokalemia. Vascular involvement can have several forms; vessel wall immune complex deposition can lead to inflammation, and, in severe cases, vascular narrowing can result. Small vessel thrombi and even fulminant thrombotic microangiopathy can occur as a result of immune complex deposition, often in association with antiphospholipid antibodies. 5. Pulmonary manifestations: There are several different lung manifestations of SLE. Pleuritis with or without pleural effusion is a common manifestation occurring in up to 50% of patients. Pulmonary fibrosis of the nonspecific interstitial fibrosis pattern is a well-recognized SLE complication. Pulmonary hypertension can either occur in isolation or be associated with another pulmonary manifestation, such as venous thromboembolic disease. Diffuse alveolar hemorrhage can result secondary to interstitial lung disease with diffuse alveolar damage or autoimmune capillaritis. Shrinking lung syndrome, characterized by dyspnea, elevated hemidiaphragm(s), and restrictive findings on pulmonary function testing in the absence of parenchymal disease, is a rare but well-recognized complication. Pulmonary embolism occurs, particularly in patients with antiphospholipid antibodies. Acute interstitial pneumonitis can occur rarely (though mortality is high), and chronic fibrotic lung disease can result. Pulmonary complications of dysregulated immunity and immunomodulatory therapy should be considered in the differential diagnosis of patients presenting with respiratory symptoms and signs, including respiratory infections, as well as adverse effects of therapy, such as pneumonitis or interstitial lung disease secondary to methotrexate use. 6. Cardiovascular manifestations include pericarditis with pericardial effusion, myocarditis (rare, usually asymptomatic, found on echocardiography as global contractility impairment in patients with unexplained tachycardia or nonspecific ST-segment and T-wave abnormalities; it may cause conduction disturbances), valvular lesions possibly leading to valve dysfunction (often associated with antiphospholipid antibodies), noninfective (Libman-Sacks) endocarditis, hypertension (due to renal involvement or as a complication of glucocorticoid treatment), and increased risk of early development of coronary artery disease. b) Cerebrovascular disease (ischemic stroke, transient ischemic attack). f) Movement disorder (eg, chorea). a) Acute inflammatory demyelinating polyneuropathy (Guillain-Barré syndrome). c) Mononeuropathy (simplex or multiplex). To date, no laboratory or imaging findings specific to NPSLE have been described, and attribution of neurologic or psychiatric symptoms to SLE can be difficult. The most common abnormality on magnetic resonance imaging (MRI) in patients who present with NPSLE is nonspecific high T2-signal intensity lesions in white matter that can be focal or diffuse. These lesions have been found to be associated with antiphospholipid antibodies. Cerebrospinal fluid can show elevated protein levels with elevated IgG index. When patients present with neurologic, psychiatric, or neuropsychological findings, physicians have to consider and rule out alternative causes, such as infections, metabolic disturbances, and adverse effects of therapy. 8. Hematologic manifestations: Common hematologic abnormalities include leukopenia, lymphopenia, anemia, and thrombocytopenia (see Diagnostic Tests, below). Clinically, lymphadenopathy is common; lymph nodes are usually soft, painless, and not fixed to the surrounding tissues. Splenomegaly can be found. Secondary thrombotic thrombocytopenic purpura can rarely occur. 9. Gastrointestinal manifestations are relatively uncommon in SLE and can include dysphagia, hepatomegaly, or aseptic peritonitis. Mesenteric or other intra-abdominal thromboses can occur in association with antiphospholipid antibodies. Diagnosis is based on the typical clinical features and results of diagnostic tests. Negative antinuclear antibody (ANA) tests by immunofluorescence make the diagnosis of SLE less likely (they are positive in >95% of patients), while positive anti-dsDNA or anti-Sm antibodies usually confirm the diagnosis. There are 2 widely used classification criteria sets for SLE: the 1997 update of the revised 1982 American College of Rheumatology (ACR) classification criteria for SLE (Table 1) and the more recent Systemic Lupus Erythematosus Collaborating Clinics Classification Criteria for SLE proposed in 2012 (Table 2). a) Inflammatory markers: Neither the erythrocyte sedimentation rate (ESR) nor C-reactive protein (CRP) is a reliable indicator of disease activity in SLE. In patients with polyclonal gammopathy, the ESR can be chronically elevated even in the absence of disease activity. b) Hemoglobin: An inflammatory anemia (anemia of chronic disease) is commonly found in patients with SLE, characterized by elevated ferritin levels with low serum iron, iron saturation, and total iron-binding capacity. Hemolytic anemia with a positive Coombs test result is characteristic of SLE and is an indication for systemic glucocorticoid and/or immunomodulatory therapy. c) White blood cells: Leukopenia (15%-20% of patients) and lymphopenia <1500 cells/mm3 are common in SLE and usually do not require specific therapy. Severe neutropenia may require therapy. d) Platelets: Thrombocytopenia is common and can be caused either by immunologic disturbances associated with SLE or by secondary antiphospholipid syndrome. e) Creatinine: Creatinine levels can be elevated in class III, IV, or V lupus nephritis. f) Hypergammaglobulinemia: Hypergammaglobulinemia is generally polyclonal. It may or may not be associated with active disease. 2) Urinalysis: Proteinuria is generally present in class III, IV, and V lupus nephritis; hematuria or pyuria can also be present, particularly in class III and IV nephritis. Urine sediment examination in class III and IV lupus nephritis can reveal dysmorphic erythrocyte, leukocyte, and erythrocyte casts. 3) Immunology: More than 95% of patients with SLE exhibit ANAs, including extractable nuclear antigens (ENAs) by immunofluorescence or newer immunoassays (BioPlex). ANAs/ENAs represent a group of autoreactive antibodies directed against the nucleus. ENAs constitute antibodies to specific nuclear components, and these reactivities may predict clinical subtypes/phenotypes of lupus. The anti-dsDNA and anti-Sm antibodies are highly specific (95%-97%) for SLE diagnosis. Drug-induced SLE is associated with antihistone antibodies in >95% of people. Some autoantibodies are more specific to the involvement of certain organs, for instance: anti-dsDNA, lupus nephritis; anti-RNP, myositis; anti-SSA/anti-Ro, lymphopenia, lymphadenopathy, SCLE, sicca complex. Higher disease activity can correlate with low levels of C3 or C4 complement components and elevated levels of anti-dsDNA; in particular, all these can accompany activity of lupus nephritis. Antiphospholipid antibodies (anticardiolipin, anti–beta2-glycoprotein I, nonspecific inhibitor) are found in ~30% of patients with SLE. 1) Skin: Skin biopsy samples taken from the areas with evident erythematous lesions or even from apparently healthy skin can reveal immunoglobulin and complement deposits along the border of the epidermis and dermis, although these may also occur in other skin conditions as well as in 20% of healthy individuals. 2) Renal: Kidney biopsy is indicated in the majority of patients with features of lupus nephritis. Biopsy results identify the type of glomerular lesions as well as the activity and chronic character of renal involvement, which has implications for both management and prognosis (see above). Other connective tissue diseases that can coexist or may be confused with SLE include Sjögren syndrome, systemic sclerosis, dermatomyositis/polymyositis, drug-induced SLE, mixed connective tissue disease (MCTD), and undifferentiated connective tissue disease (UCTD). However, depending on the specific clinical manifestations under consideration, differential diagnosis may be very broad and can include a variety of different conditions. For example, hematological abnormalities may be due to drug-induced lupus (causes: Table 3), myeloproliferative disorders (particularly lymphomas), idiopathic thrombocytopenic purpura, microangiopathic hemolytic anemias, antiphospholipid syndrome, or infections. Facial rash may need to be differentiated from rosacea, seborrheic dermatitis, photodermatoses, and dermatomyositis. Conditions that may be associated with positive autoantibodies: Table 3. The therapy of SLE varies based on specific clinical manifestations. While treatments of some specific manifestations of SLE (eg, lupus nephritis) have been reasonably well studied, management of many manifestations of SLE is hindered by a lack of high-quality comparative evidence. Thus, medication use in SLE is guided in many cases by uncontrolled studies, case series, and expert opinion. Guidance from a specialist physician with expertise in SLE management may be necessary. 1. Nonpharmacologic treatment: It is important for patients with SLE to avoid exposure to ultraviolet radiation by avoiding sunlight as well as tanning beds. Ultraviolet light is associated with both cutaneous SLE activity and increased overall SLE disease activity. 2. Pharmacologic treatment: Glucocorticoids are very effective for acute management of active SLE and are indicated in all patients with moderate or severe disease manifestations. However, given the potential adverse effects of glucocorticoids, concomitant use of other immunomodulatory agents is indicated in virtually all patients with SLE. The choice of medications and their dosage depends on predominant clinical features and disease activity. 1) Antimalarials: Hydroxychloroquine 6.5 mg/kg (usual maximum dose, 400 mg daily) or, if hydroxychloroquine is not tolerated, chloroquine 250 to 500 mg daily is indicated in all patients with SLE.Evidence 1Strong recommendation (benefits clearly outweigh downsides; right action for all or almost all patients). Moderate Quality of Evidence (moderate confidence that we know true effects of intervention). Quality of Evidence lowered due to imprecision. For further information, see Appendix 1 at the end of the chapter. All patients taking antimalarial medications require screening for the rare risk of associated antimalarial-induced retinopathy. The timing of screening is variable, based on risk of retinopathy, and ranges from every 6 months to annually. Low-risk patients can generally be effectively screened by an optometrist. However, higher-risk patients and patients in whom a concern regarding hydroxychloroquine-induced retinopathy has been raised should be evaluated by an ophthalmologist. 2) Methotrexate: Methotrexate is often used to achieve disease control in patients in whom glucocorticoids cannot be tapered off, or for whom disease activity is incompletely controlled with glucocorticoids and hydroxychloroquine. Typical manifestations thought to be controlled by methotrexate include arthritis, cutaneous manifestations, and serositis. Typical doses range from 15 to 25 mg weekly administered orally or subcutaneously. Patients need to be monitored for liver enzyme elevation and cytopenias on a monthly basis or more frequently in higher-risk situations. Other adverse effects include potential development of interstitial lung disease or the risk of acute hypersensitivity pneumonitis. Methotrexate is teratogenic and should not be used in pregnant patients. 3) Azathioprine: Azathioprine is often used to achieve disease control in patients who are unable to taper off glucocorticoids or in whom disease activity is incompletely controlled with glucocorticoids and hydroxychloroquine. 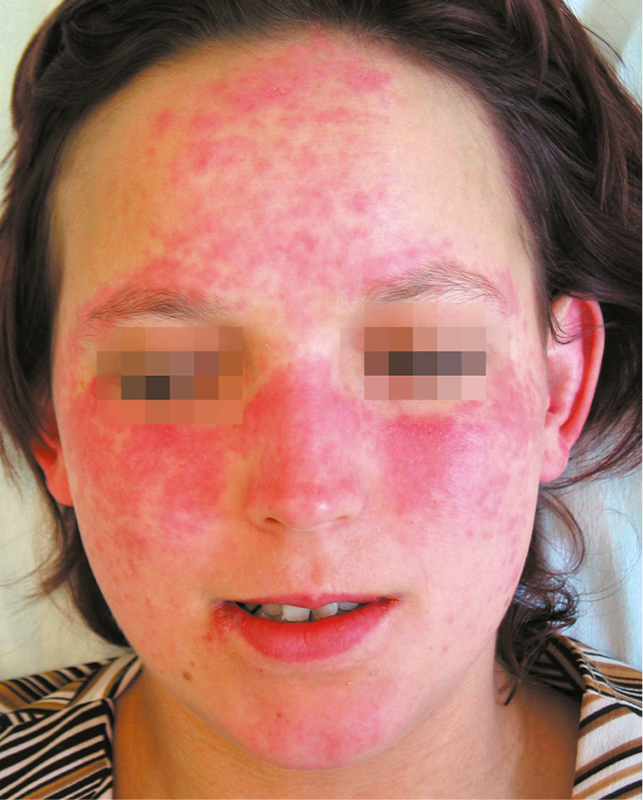 Typical manifestations thought to be controlled by azathioprine include cutaneous manifestations, serositis, and hematological abnormalities. It is also used as maintenance therapy for renal disease. Typical doses range from 1 to 3 mg/kg/d. Patients need to be monitored for cytopenias and liver enzyme elevation, initially every 2 weeks for 2 months, then monthly thereafter if no issues have been identified. Cytopenias can pose a particular risk in patients who have low or deficient thiopurine methyltransferase (TPMT) activity, and TMPT genotyping can be considered prior to the initiation of therapy with azathioprine. 4) Mycophenolate mofetil (MMF)/mycophenolic acid: MMF is the ester prodrug of mycophenolic acid. These medications are used to control disease in SLE, particularly in patients with active class III, IV, or severe class V lupus nephritis. It may have some benefit in the management of cutaneous manifestations and hematologic abnormalities in SLE, though there have been few studies addressing these particular manifestations. Doses differ depending on the agent used. When used for induction therapy for lupus nephritis, MMF is typically administered at 2 to 3 g/d in divided doses. Patients should be monitored for cytopenias on a monthly basis, or more frequently in higher-risk situations. Other adverse effects include elevation in cholesterol levels and gastrointestinal intolerance. The teratogenic potential of MMF is unknown, and at this time it is not recommended for use in pregnancy. 5) Cyclophosphamide: Cyclophosphamide was first introduced in the treatment of class III or IV lupus nephritis (see below) in combination with glucocorticoids, either in pulse or daily dose regimens. Because of its potentially irreversible adverse effects on fertility, currently its use in SLE as a potent immunosuppressive agent is typically reserved for rapidly progressive nephritis unresponsive to MMF and for other severe, potentially life-threatening manifestations of SLE, including severe cutaneous vasculitis, diffuse alveolar hemorrhage, interstitial pneumonitis, NPSLE, or hematological manifestations, such as refractory autoimmune hemolytic anemia. Cyclophosphamide has a risk of causing cytopenias, particularly leukopenia. If it is being administered intravenously, a complete blood count should be performed at the time of white blood cell nadir at 7 to 10 days after administration and every 2 weeks thereafter. A repeat administration should not be given until the white blood cell count has recovered. For oral cyclophosphamide, the complete blood count should be monitored at least every 2 weeks or more frequently. 6) Rituximab: There has been controversy regarding the role of rituximab in SLE. At this time, use of rituximab is generally limited to special circumstances only. 7) Belimumab: Belimumab is a monoclonal antibody against anti–B lymphocyte-stimulating factor given as an IV infusion. It has recently received an approval for use as an addition to the standard therapy for active nonrenal, nonneuropsychiatric SLE manifestations. Belimumab is used particularly to attempt to spare glucocorticoids in patients who have been unable to taper off glucocorticoids to an acceptable level. 1) Avoidance of sunlight exposure: Protective clothing, sunscreens with a sun protection factor ≥15. 2) Topical treatment: Glucocorticoid ointments and creams (fluorinated glucocorticoids cause skin atrophy and should be used for short periods) or calcineurin inhibitors (eg, 0.1% tacrolimus). 3) Systemic treatment: Antimalarial agents, methotrexate, retinoids (eg, isotretinoin), other agents (eg, thalidomide, dapsone, mycophenolate mofetil, azathioprine), intravenous immunoglobulin (IVIG), and biological agents (eg, rituximab) may also be used. 1) Autoimmune hemolytic anemia and autoimmune thrombocytopenia usually respond well to glucocorticoids. Other agents that may be effective include azathioprine, MMF, cyclosporine (INN ciclosporin), cyclophosphamide, IVIG, and rituximab. In treatment-resistant patients, splenectomy may be considered. 2) Leukopenia usually does not require treatment. In the case of granulocyte counts <500 cells/microL, consider granulocyte colony-stimulating factor (G-CSF). 3) Thrombotic thrombocytopenic purpura: See Peripheral Thrombocytopenia. 4) Macrophage activation syndrome: See Special Considerations, below. 3. Arthralgia, myalgia, and arthritis: For arthralgia, myalgia, and arthritis, nonsteroidal anti-inflammatory drugs (NSAIDs) and antimalarials are the mainstays of therapy. For severe inflammatory arthritis in the acute phase, glucocorticoids are typically effective, and patients generally respond to doses of <15 mg of prednisone or equivalent daily. Methotrexate is often effective in patients with arthritis with incomplete response to antimalarials or dependence on prednisone. 4. Serositis: Acutely, NSAIDs can be used for more mild serositis, while glucocorticoids at a low to moderate dose (up to 40 mg/d, then the dose is tapered off) may be necessary for more refractory symptoms or large associated effusions. Antimalarial agents, methotrexate, and azathioprine are also effective. 1) In all patients with nephropathy, blood pressure should be managed to a target <130/80 mm Hg (see Renovascular Hypertension). 2) In patients with proteinuria, administer an angiotensin-converting enzyme inhibitor (ACEI) or angiotensin-receptor blocker (ARB). For patients with nephrotic syndrome, see management of nephrotic syndrome. 3) Immunomodulatory treatment: In all patients with lupus nephritis, including those in remission, antimalarial therapy is recommended. Otherwise, management of lupus nephritis depends upon the class of renal disease seen on renal biopsy (see above). Guidelines for the management of lupus nephritis have been recently published by the ACR, as well as jointly by the European League Against Rheumatism (EULAR) and European Renal Association-European Dialysis and Transplant Association (ERA-EDTA). a) Class I: No immunosuppressive treatment is required. b) Class II: Guidelines differ with regards to management of class II lupus nephritis. Both groups felt that no immunosuppressive therapy was required for class II nephropathy with proteinuria <1 g/d. The EULAR/ERA-EDTA guidelines recommend low to moderate doses of prednisone (0.25-0.5 mg/kg) plus azathioprine in patients with proteinuria >1 g/d, while no specific mention is made regarding this group in the ACR guidelines. The patients need careful monitoring for disease progression and for indications for repeat renal biopsy. c) Class III and IV: Intensive immunosuppressive treatment (glucocorticoids + cyclophosphamide or MMF) is necessary due to the poor prognosis and progression to end-stage renal failure. b) Cyclophosphamide 0.5 g in an IV infusion every 2 weeks for 3 months or oral MMF 2 to 3 g/d for 6 months.Evidence 2Strong recommendation (benefits clearly outweigh downsides; right action for all or almost all patients). High Quality of Evidence (high confidence that we know true effects of intervention). For more information about the choice between cyclophosphamide and MMF, see Appendix 2 at the end of the chapter. In the case of disease progression in the first 3 months of induction therapy, switch to the alternative treatment, that is, substitute cyclophosphamide for MMF or vice versa. In patients with acute kidney injury requiring renal replacement therapy, the treatment with glucocorticoids and cyclophosphamide may be supplemented with plasmapheresis (daily for 7 days, with the exchange of 4 L of plasma during each cycle). This recommendation is extrapolated from studies on the use of plasmapheresis in crescentic glomerulonephritis, though notably plasmapheresis has not been shown to be of benefit in lupus nephritis. In patients resistant to the above therapy, rituximab, IVIG, or cyclosporine may be used. a) Complete remission: Reduction of proteinuria to <0.5 g/d and reduction of serum creatinine to the levels observed before the onset of the disease. b) Partial remission: Stabilization or reduction of serum creatinine levels (but not return to the levels observed before the onset of the disease) and ≥50% reduction of proteinuria. Failure to achieve a complete remission after 12 months of treatment is an indication for a repeated kidney biopsy. An increase in proteinuria or serum creatinine levels during the reduction of drug doses indicates the need for increasing them back to the doses that maintained disease control. Maintenance therapy (<3 years after remission induction) is directed at preventing recurrences and maintaining disease activity at the lowest possible level. Both MMF (1-2 g/d) and azathioprine (2 mg/kg/d) are recommended, though some evidence from randomized controlled trials suggests superiority of MMF. Frequently, a low-dose glucocorticoid (eg, prednisone 5-7.5 mg/d or equivalent) is maintained. d) Class V: The prognosis is usually good. In patients with persistent proteinuria in the nephrotic range and/or renal insufficiency, glucocorticoids are recommended in conjunction with MMF.Evidence 3Strong recommendation (benefits clearly outweigh downsides; right action for all or almost all patients). Moderate Quality of Evidence (moderate confidence that we know true effects of intervention). Quality of Evidence lowered due to data relying on a nonprespecified subgroup analysis. For more information on evidence, see Appendix 3 at the end of the chapter.Other agents with benefits in class V lupus nephritis and nephrotic-range proteinuria and/or renal insufficiency include cyclophosphamide and cyclosporine, which could be used for refractory disease. e) Class VI: No immunosuppressive therapy is used for this indication. The patient should be prepared for renal replacement therapy. In patients with end-stage renal failure, renal transplantation is an option, and recurrence of lupus nephritis in the transplanted kidney is thought to be a rare event. Patients are best suited for renal transplantation after control of lupus activity has been achieved for at least 6 months. 1) Neurological symptoms in a patient with SLE should prompt a search for other underlying causes aside from SLE itself; it is important to consider and exclude infection, drug reaction, and metabolic disturbances prior to instituting or amplifying immunosuppressive therapy. 2) The mainstay of therapy for active severe NPSLE symptoms, such as acute psychosis, seizures, myelopathy, peripheral neuropathy, or acute inflammatory demyelinating polyneuropathy, are high-dose glucocorticoids (a pulse of 500-1000 mg IV methylprednisolone once daily for 3 consecutive days, then 1 mg/kg to a maximum of 60 mg/d and subsequently tapered off) in conjunction with cyclophosphamide. 3) If the neurological symptoms at hand are thrombotic in origin, such as thrombotic stroke, and if they are associated with antiphospholipid antibodies (APLAs), antiplatelet and/or anticoagulant drugs may be the most appropriate management (see Antiphospholipid Syndrome). 4) Adjunctive treatment can be used as appropriate to the individual NPSLE manifestation. For example, antiepileptic drugs are indicated in the management of seizures, and antipsychotic medications may be indicated in acute psychosis. 1. Discontinue the drug that has caused the symptoms; in most cases, this will lead to the resolution of symptoms within a few days. The exception to this is hydralazine, in which case a more prolonged course of symptoms can occur. 2. In rare cases, depending on the severity of clinical manifestations, the use of NSAIDs and/or glucocorticoids and/or antimalarials for a limited time may be required. 1) Osteoporosis prophylaxis in patients treated with glucocorticoids. 2) Addressing cardiovascular risk factors, given the associated risk of early cardiovascular disease. 3) Vaccinations, particularly influenza and pneumococcal vaccines. Other vaccinations may be considered on the basis of an individual risk. Live vaccines are often contraindicated in patients with SLE due to the use of immunomodulatory agents. a) Estrogen-containing oral contraceptive pills do not increase disease activity in SLE in patients with well-controlled disease.Evidence 4High Quality of Evidence (high confidence that we know true effects of intervention). For more information, see Appendix 4 at the end of the chapter. b) Estrogen-containing contraceptives should be avoided in patients with APLA due to the increased thrombosis risk.Evidence 5Strong recommendation (downsides clearly outweigh benefits; right action for all or almost all patients). Low Quality of Evidence (low confidence that we know true effects of the intervention). Quality of Evidence lowered due to the lack of experimental data. For more information, see Appendix 5 at the end of the chapter. c) Many immunomodulatory agents used in SLE are teratogenic and must be stopped for an appropriate interval prior to any attempt at conception (depending on the medication, this interval can be <6 months). Attempt at conception should ideally be made only after there has been clinical and serological quiescence of SLE activity for >6 months.Evidence 6Strong recommendation (benefits clearly outweigh downsides; right action for all or almost all patients). Low Quality of Evidence (low confidence that we know true effects of the intervention). Quality of Evidence lowered due to the observational nature of data. For more information, see Appendix 6 at the end of the chapter. 5) In patients with persistently high titers of APLA, consider antiplatelet agents and/or hydroxychloroquine (see Antiphospholipid Syndrome). 1. In patients with complete remission and no evidence of target organ damage or comorbidities, follow-up appointments every 6 to 12 months are recommended. The remaining patients should be followed up more frequently. 2. Estimate the activity of SLE and diagnose recurrences on the basis of clinical symptoms, laboratory parameters (complete blood count, creatinine and albumin levels, proteinuria, urine sediment, C3 and C4 complement levels, and anti-dsDNA titers), and general SLE activity indices (eg, systemic lupus erythematosus disease activity index [SLEDAI]). These should be followed up every 3 to 12 months, depending on the clinical situation. 3. APLA levels should be measured before an intended pregnancy, surgery, or estrogen therapy. 4. Patients should undergo a diagnostic workup of hepatitis B virus, hepatitis C virus, cytomegalovirus, and tuberculosis infections based on the individual risk, particularly before starting an intensive immunosuppressive treatment. Macrophage activation syndrome (MAS) is one of the acquired forms of hemophagocytic lymphohistiocytosis (HLH) that occurs in patients with rheumatic disorders, most commonly with systemic idiopathic juvenile arthritis and in adults with SLE. It manifests with increased and prolonged activity of macrophages and T cells (particularly CD8+), leading to an uncontrolled inflammatory response. The manifestations include fever, hepatomegaly, splenomegaly, lymphadenopathy, cytopenias, elevated liver enzymes, disseminated intravascular coagulation, hypofibrinogenemia, hyperferritinemia, and hypertriglyceridemia. Diagnosis is based on the general HLH criteria; however, these criteria have not been validated in patients with SLE. MAS requires differentiation from sepsis, malignancy, and exacerbations of SLE. Treatment is controversial, and there is little evidence to guide therapy in this condition. Management typically consists of initially high-dose glucocorticoids, along with varying combinations of IVIG, cyclosporine, cyclophosphamide, tacrolimus, or etoposide. Poor prognostic factors include infection and C-reactive protein levels >50 mg/L. SLE does not affect fertility, but it is associated with risks related to pregnancy and the health of both the mother and the child. It is recommended that female patients do not become pregnant until remission has been achieved. Flares occur in ~30% of pregnant patients with SLE; they are more likely to occur and can be more severe in patients in whom good control of disease activity was not achieved prior to conception. Antimalarials, glucocorticoids, and azathioprine are generally considered safe in pregnancy and are typically continued. NSAIDs have been associated with an increased risk of spontaneous abortion in the first trimester as well as with premature closure of the ductus arteriosus in the third trimester; however, they are generally considered safe in the second trimester. Obstetric complications and preeclampsia are mainly associated with APLA and lupus nephritis. The presence of anti-Ro and anti-La antibodies in the mother may cause neonatal lupus (in 3% of affected pregnancies) and is associated with cardiac conduction defects and congenital heart block. Patients with anti-Ro and/or anti-La antibodies should be followed by a high-risk obstetrical team and the fetus should be screened with fetal echocardiogram at intervals during pregnancy. Breastfeeding is possible, though care must be taken to use only medications compatible with breastfeeding. Before the procedure, disease activity should be assessed, as surgery may worsen the course of SLE. It is recommended to achieve remission before surgery, unless it cannot be postponed. The most rapid improvement can be achieved with perioperative glucocorticoids. The most common causes of death in patients with early SLE include infections and severe target organ involvement (central nervous system, cardiovascular system, acute lupus pneumonitis, severe nephropathy); in patients with long-standing disease, these include complications of treatment (infections) and the effects of accelerated atherosclerosis as well as thromboembolism. With appropriate diagnosis and treatment, the 10-year overall survival rate is 80% to 98% depending on age at diagnosis, specific cohort studied, and country of origin, and the 20-year survival rate is ~65%. More than 40% to 50% of patients develop some degree of permanent target organ damage after 5 years of follow-up. In lupus nephritis, 10% to 30% of patients develop end-stage renal failure over 15 years despite treatment. Recurrence of SLE in transplanted kidneys is very rare (2%). ECG, electrocardiography; SLE, systemic lupus erythematosus; VLDR, venereal disease research laboratory. * Requirements: ≥4 criteria (at least 1 clinical and 1 laboratory criteria) or biopsy-proven lupus nephritis with positive ANA or anti-DNA antibodies. Criteria are cumulative and need not be present concurrently. Source: Petri M, Orbai AM, Alarcón GS, et al. Derivation and validation of the Systemic Lupus International Collaborating Clinics classification criteria for systemic lupus erythematosus. Arthritis Rheum. 2012 Aug;64(8):2677-86. ANA, antinuclear antibodies; ECG, electrocardiography; ELISA, enzyme-linked immunosorbent assay; RBC, red blood cell; SLE, systemic lupus erythematosus. Figure 1. Systemic lupus erythematosus. Typical “butterfly” rash. Figure 2. Systemic lupus erythematosus. Severe cutaneous manifestations following sunlight exposure. Figure 3. Subacute cutaneous lupus arythematosus. Circular lesions with erythema and swelling. Figure 4. Discoid lupus erythematosus. Well-demarcated lesions with erythema, swelling, scarring, and central atrophy. The evidence is graded as moderate quality. The studies are either observational in nature or small RCTs. The evidence was downgraded from high-quality evidence due to the small size of the RCTs, resulting in imprecision on the estimates of disease activity and flare risk. This statement was given a strong recommendation because when taken together the evidence, it provides a compelling picture supporting the use of hydroxychloroquine for all patients with SLE, particularly as the toxicity associated with its use is minimal. 1 Ruiz-Irastorza G, Ramos-Casals M, Brito-Zeron P, Khamashta MA. Clinical efficacy and side effects of antimalarials in systemic lupus erythematosus: a systematic review. Ann Rheum Dis. 2010 Jan;69(1):20-8. doi: 10.1136/ard.2008.101766. Epub . Review. PubMed PMID: 19103632. 2 A randomized study of the effect of withdrawing hydroxychloroquine sulfate in systemic lupus erythematosus. The Canadian Hydroxychloroquine Study Group. N Engl J Med. 1991 Jan 17;324(3):150-4. PubMed PMID: 1984192. 3 Willis R, Seif AM, McGwin G Jr, et al. Effect of hydroxychloroquine treatment on pro-inflammatory cytokines and disease activity in SLE patients: data from LUMINA (LXXV), a multiethnic US cohort. Lupus. 2012 Jul;21(8):830-5. doi: 10.1177/0961203312437270. Epub 2012 Feb 17. PubMed PMID: 22343096; PubMed Central PMCID: PMC3808832. 4 Francès C, Cosnes A, Duhaut P, et al. Low blood concentration of hydroxychloroquine in patients with refractory cutaneous lupus erythematosus: a French multicenter prospective study. Arch Dermatol. 2012 Apr;148(4):479-84. doi: 10.1001/archdermatol.2011.2558. PubMed PMID: 22508872. 5 Costedoat-Chalumeau N, Amoura Z, Hulot JS, et al. Low blood concentration of hydroxychloroquine is a marker for and predictor of disease exacerbations in patients with systemic lupus erythematosus. Arthritis Rheum. 2006 Oct;54(10):3284-90. PubMed PMID: 17009263. 6 Costedoat-Chalumeau N, Galicier L, Aumaître O, et al; Group PLUS. Hydroxychloroquine in systemic lupus erythematosus: results of a French multicentre controlled trial (PLUS Study). Ann Rheum Dis. 2013 Nov;72(11):1786-92. doi: 10.1136/annrheumdis-2012-202322. Epub 2012 Nov 10. PubMed PMID: 23144449. 7 Yokogawa N, Tanikawa A, Amagai M, et al. Response to hydroxychloroquine in Japanese patients with lupus-related skin disease using the cutaneous lupus erythematosus disease area and severity index (CLASI). Mod Rheumatol. 2013 Mar;23(2):318-22. doi: 10.1007/s10165-012-0656-3. Epub 2012 May 12. Erratum in: Mod Rheumatol. 2014 Jul;24(4):701. PubMed PMID: 22581095. 8 Jung H, Bobba R, Su J, et al. The protective effect of antimalarial drugs on thrombovascular events in systemic lupus erythematosus. Arthritis Rheum. 2010 Mar;62(3):863-8. doi: 10.1002/art.27289. PubMed PMID: 20131232. 9 Tektonidou MG, Laskari K, Panagiotakos DB, Moutsopoulos HM. Risk factors for thrombosis and primary thrombosis prevention in patients with systemic lupus erythematosus with or without antiphospholipid antibodies. Arthritis Rheum. 2009 Jan 15;61(1):29-36. doi: 10.1002/art.24232. PubMed PMID: 19116963. 10 Becker-Merok A, Nossent J. Prevalence, predictors and outcome of vascular damage in systemic lupus erythematosus. Lupus. 2009 May;18(6):508-15. doi: 10.1177/0961203308099233. PubMed PMID: 19395452. 11 Akhavan PS, Su J, Lou W, Gladman DD, Urowitz MB, Fortin PR. The early protective effect of hydroxychloroquine on the risk of cumulative damage in patients with systemic lupus erythematosus. J Rheumatol. 2013 Jun;40(6):831-41. doi: 10.3899/jrheum.120572. Epub 2013 Apr 15. PubMed PMID: 23588942. 12 Fessler BJ, Alarcón GS, McGwin G Jr, et al; LUMINA Study Group. Systemic lupus erythematosus in three ethnic groups: XVI. Association of hydroxychloroquine use with reduced risk of damage accrual. Arthritis Rheum. 2005 May;52(5):1473-80. PubMed PMID: 15880829. 13 Pons-Estel GJ, Alarcón GS, González LA, et al; Lumina Study Group. Possible protective effect of hydroxychloroquine on delaying the occurrence of integument damage in lupus: LXXI, data from a multiethnic cohort. Arthritis Care Res (Hoboken). 2010 Mar;62(3):393-400. doi: 10.1002/acr.20097. PubMed PMID: 20391486; PubMed Central PMCID: PMC3202433. 14 Pons-Estel GJ, Alarcón GS, McGwin G Jr, et al; Lumina Study Group. Protective effect of hydroxychloroquine on renal damage in patients with lupus nephritis: LXV, data from a multiethnic US cohort. Arthritis Rheum. 2009 Jun 15;61(6):830-9. doi: 10.1002/art.24538. PubMed PMID: 19479701; PubMed Central PMCID: PMC2898742. 15 Izmirly PM, Costedoat-Chalumeau N, Pisoni CN, et al. Maternal use of hydroxychloroquine is associated with a reduced risk of recurrent anti-SSA/Ro-antibody-associated cardiac manifestations of neonatal lupus. Circulation. 2012 Jul 3;126(1):76-82. doi: 10.1161/CIRCULATIONAHA.111.089268. Epub 2012 May 24. PubMed PMID: 22626746; PubMed Central PMCID: PMC3437628. 16 Kavanaugh A, Adams-Huet B, Jain R, Denke M, McFarlin J. Hydroxychloroquine Effects on Lipoprotein Profiles (the HELP trial): A Double-Blind, Randomized, Placebo-Controlled, Pilot Study In Patients With Systemic Lupus Erythematosus. J Clin Rheumatol. 1997 Feb;3(1):3-8. PubMed PMID: 19078110. 17 Cairoli E, Rebella M, Danese N, Garra V, Borba EF. Hydroxychloroquine reduces low-density lipoprotein cholesterol levels in systemic lupus erythematosus: a longitudinal evaluation of the lipid-lowering effect. Lupus. 2012 Oct;21(11):1178-82. doi: 10.1177/0961203312450084. Epub 2012 May 28. PubMed PMID: 22641182. 18 Broder A, Putterman C. Hydroxychloroquine use is associated with lower odds of persistently positive antiphospholipid antibodies and/or lupus anticoagulant in systemic lupus erythematosus. J Rheumatol. 2013 Jan;40(1):30-3. doi: 10.3899/jrheum.120157. Epub 2012 Aug 1. PubMed PMID: 22859353; PubMed Central PMCID: PMC3768146. 19 Levy RA, Vilela VS, Cataldo MJ, et al. Hydroxychloroquine (HCQ) in lupus pregnancy: double-blind and placebo-controlled study. Lupus. 2001;10(6):401-4. PubMed PMID: 11434574. 20 Sperber K, Hom C, Chao CP, Shapiro D, Ash J. Systematic review of hydroxychloroquine use in pregnant patients with autoimmune diseases. Pediatr Rheumatol Online J. 2009 May 13;7:9. doi: 10.1186/1546-0096-7-9. PubMed PMID: 19439078; PubMed Central PMCID: PMC2690583. 21 Costedoat-Chalumeau N, Amoura Z, Duhaut P, et al. Safety of hydroxychloroquine in pregnant patients with connective tissue diseases: a study of one hundred thirty-three cases compared with a control group. Arthritis Rheum. 2003 Nov;48(11):3207-11. PubMed PMID: 14613284. 22 Costedoat-Chalumeau N, Amoura Z, Huong DL, Lechat P, Piette JC. Safety of hydroxychloroquine in pregnant patients with connective tissue diseases. Review of the literature. Autoimmun Rev. 2005 Feb;4(2):111-5. Epub 2004 Dec 14. Review. PubMed PMID: 15722258. Three systematic reviews have been performed comparing MMF with IV cyclophosphamide in induction therapy for lupus nephritis. The authors have reached the same conclusion, stating that MMF is equally effective in achieving complete renal remission, partial renal remission, stable renal function, and complete remission of proteinuria.1,2,3 Rates of death and serious infection were not different between groups, though rates of ovarian failure, alopecia, and leukopenia were higher with cyclophosphamide. Both the ACR as well as the EULAR/ERA-EDTA recommend the use of either MMF or IV cyclophosphamide in addition to glucocorticoids for induction therapy. For patients in whom preservation of ovarian function is important, MMF should be considered over cyclophosphamide. This evidence was graded as high-quality as it is based on well-designed RCTs with a low risk of bias. The evidence has further been summarized in systematic reviews. 1 Henderson LK, Masson P, Craig JC, et al. Induction and maintenance treatment of proliferative lupus nephritis: a meta-analysis of randomized controlled trials. Am J Kidney Dis. 2013 Jan;61(1):74-87. doi: 10.1053/j.ajkd.2012.08.041. Epub 2012 Nov 22. PubMed PMID: 23182601. 2 Touma Z, Gladman DD, Urowitz MB, Beyene J, Uleryk EM, Shah PS. Mycophenolate mofetil for induction treatment of lupus nephritis: a systematic review and metaanalysis. J Rheumatol. 2011 Jan;38(1):69-78. doi: 10.3899/jrheum.100130. Epub 2010 Oct 15. Review. PubMed PMID: 20952473. 3 Walsh M, James M, Jayne D, Tonelli M, Manns BJ, Hemmelgarn BR. Mycophenolate mofetil for induction therapy of lupus nephritis: a systematic review and meta-analysis. Clin J Am Soc Nephrol. 2007 Sep;2(5):968-75. Epub 2007 Aug 8. Review. PubMed PMID: 17702723. An RCT demonstrated that the probability of remission of proteinuria in class V lupus nephritis over 12 months was significantly higher with cyclophosphamide and glucocorticoids compared to glucocorticoids alone.1 Cyclosporine showed a comparable rate of remission of proteinuria to cyclophosphamide; however, it was associated with a higher relapse rate. Radhakrishnan et al. published a study combining results from all patients with pure class V lupus nephritis from 2 RCTs comparing MMF (2-3g/d in divided doses) with IV cyclophosphamide as induction therapy for various classes of lupus nephritis.2 Both groups received concomitant glucocorticoids. The study revealed a significant change in mean proteinuria after 24 weeks of therapy in both groups, with stable serum creatinine levels. No significant differences were noted between the groups. Given the fertility concerns with cyclophosphamide, MMF is typically recommended over cyclophosphamide. This evidence was graded as moderate quality as it used a nonspecified subgroup analysis of the RCT data. This recommendation was rated as strong as there were good outcomes noted in the study, with stability of creatinine levels and reduction of proteinuria in a relatively high-risk subset of patients with class V lupus nephritis. 1 Austin HA 3rd, Illei GG, Braun MJ, Balow JE. Randomized, controlled trial of prednisone, cyclophosphamide, and cyclosporine in lupus membranous nephropathy. J Am Soc Nephrol. 2009 Apr;20(4):901-11. doi: 10.1681/ASN.2008060665. Epub 2009 Mar 18. PubMed PMID: 19297556; PubMed Central PMCID: PMC2663831. 2 Radhakrishnan J, Moutzouris DA, Ginzler EM, Solomons N, Siempos II, Appel GB. Mycophenolate mofetil and intravenous cyclophosphamide are similar as induction therapy for class V lupus nephritis. Kidney Int. 2010 Jan;77(2):152-60. doi: 10.1038/ki.2009.412. Epub 2009 Nov 4. PubMed PMID: 19890271. A meta-analysis including 2 well-designed RCTs did not show a statistically significant difference between disease activity scores or risk of flares in patients taking oral contraceptive pills.1 The patient population was predominantly patients with SLE with well-controlled disease, and data cannot be confidently extrapolated to patients with active disease, nor to patients with antiphospholipid antibody positivity. The evidence was graded as high-quality as it stems from 2 well-designed RCTs. It was given a strong recommendation due to the high-quality evidence and the ubiquitous use of estrogen-containing oral contraceptive pills in family planning. 1 Rojas-Villarraga A, Torres-Gonzalez JV, Ruiz-Sternberg ÁM. Safety of hormonal replacement therapy and oral contraceptives in systemic lupus erythematosus: a systematic review and meta-analysis. PLoS One. 2014 Aug 19;9(8):e104303. doi: 10.1371/journal.pone.0104303. eCollection 2014. Review. PubMed PMID: 25137236; PubMed Central PMCID: PMC4138076. This evidence was graded as low-quality given the observational nature of the studies. Despite the paucity of high-quality evidence to guide recommendations in this area, given the risk of potential morbidity in patients experiencing thrombosis as well as the availability of nonhormonal contraceptives, the authors give a strong recommendation to avoid estrogen-containing contraceptives in patients with SLE and APLAs. 1 Choojitarom K, Verasertniyom O, Totemchokchyakarn K, Nantiruj K, Sumethkul V, Janwityanujit S. Lupus nephritis and Raynaud's phenomenon are significant risk factors for vascular thrombosis in SLE patients with positive antiphospholipid antibodies. Clin Rheumatol. 2008 Mar;27(3):345-51. Epub 2007 Sep 2. PubMed PMID: 17805483. 2 Rojas-Villarraga A, Torres-Gonzalez JV, Ruiz-Sternberg ÁM. Safety of hormonal replacement therapy and oral contraceptives in systemic lupus erythematosus: a systematic review and meta-analysis. PLoS One. 2014 Aug 19;9(8):e104303. doi: 10.1371/journal.pone.0104303. eCollection 2014. Review. PubMed PMID: 25137236; PubMed Central PMCID: PMC4138076. This evidence was rated as low-quality due to the observational nature of the studies. However, given the potential maternal and fetal risks associated with active SLE in pregnancy, measures to control active SLE prior to conception were felt to merit a strong recommendation. 1 Smyth A, Oliveira GH, Lahr BD, Bailey KR, Norby SM, Garovic VD. A systematic review and meta-analysis of pregnancy outcomes in patients with systemic lupus erythematosus and lupus nephritis. Clin J Am Soc Nephrol. 2010 Nov;5(11):2060-8. doi: 10.2215/CJN.00240110. Epub 2010 Aug 5. Review. PubMed PMID: 20688887; PubMed Central PMCID: PMC3001786. 2 Yang H, Liu H, Xu D, et al. Pregnancy-related systemic lupus erythematosus: clinical features, outcome and risk factors of disease flares--a case control study. PLoS One. 2014 Aug 13;9(8):e104375. doi: 10.1371/journal.pone.0104375. eCollection 2014. PubMed PMID: 25118692; PubMed Central PMCID: PMC4131906. 3 Ko HS, Ahn HY, Jang DG, et al. Pregnancy outcomes and appropriate timing of pregnancy in 183 pregnancies in Korean patients with SLE. Int J Med Sci. 2011;8(7):577-83. Epub 2011 Oct 1. PubMed PMID: 22022210; PubMed Central PMCID: PMC3198253.